Platform Sales & Hire Ltd has over 25 years of experience in supplying equipment to the aviation industry. We have supplied many of the worlds leading airlines both powered access and fixed staging. Our 25 years experience allows us to propose the correct equipment to suit both our clients technical and financial considerations. In recent years we have successfully developed the Flying Carpet VM26 vehicle mounted scissor lift mounted on 3.5 Tonne Chasis Cab, which can give access to the APU area of an A380 aircraft. The design is very compact to give greater manoevibility around both and hanger and apron areas. Platform Sales & Hire Ltd can also offer a full range of standard self propelled platforms for hanger and apron maintenance. These include a large range of Scissor Lifts and Cherry Pickers to reduce the need for expensive fixed staging that will only fit one aircraft. We have recently supplied Easyjet at London Luton with a range of equipment and also Ryanair at their London Standstead and Prestwick maintenance facilities. 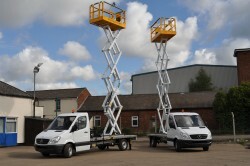 The full range of scissor lifts and cherry pickers can be supplied either new or refurbished all over the world. Platform Sales also has a wide range of used Aviation Genie Vehicles such as the Aviation Genie Z45/25J Bi-Fuel, Genie Z60/34, Genie GS1932, Genie GS2032, Genie GS3246, Genie GS2646, Genie Z51, Genie S60, Genie S65, Genie S80, Genie S85, Genie S125, Genie Super Lift as well as Aviation JLG’s, Aviation Niftylift’s and Aviation Skyjack’s. Platform Sales & Hire Ltd can supply many types of aircraft docking and staging, ranging from simple steps up to a full Taildock assembly. Our docking can be fixed or mobile and we supply in both steel and aluminium. We can also supply steel system scaffold docks; these are particularly useful for making mobile engine access units on executive jets such as the Gulfstream G5 type aircraft. We have supplied Monarch Aircraft Engineering with an adjustable mobile taildock for Boeing 757 tail access. We can also supply temporary scaffolding systems for use when an aircraft needs to be painted, this is usually supplied on a short term rental basis, this service includes supply build and dismantle costs. We have our own team who can liaise with the companies maintenance team to design and supply the most suitable and cost effective equipment for the access requirement. The Flying Carpet is a truck mounted scissorlift access platform which has been developed by Platform Sales & Hire Ltd. We have designed it specifically for use in the aircraft industry. 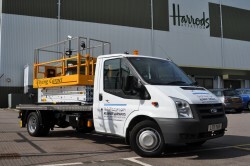 The scissorlift access platform is mounted on a 3.5tonne chassis cab, thus allowing the unit to be very compact, this makes it easy to drive and manoeuvre around the tight confines found in airport ramp and hangar areas. Because of its light weight the truck can be driven by the engineers on a standard European driving licence. The Flying Carpet has a capacity (SWL) of 280kgs which allows for 3 men plus tools, the working height is 10m (32ft) and access to the APU area of most aircraft can be gained. The work platform is also fitted with a slide out cantilever deck, which makes it easier to access the windshield area. We have supplied the Flying Carpet to many airlines around the World including Cathay Pacific, Qatar Airways, United Airlines, Iberia, KLM Royal Dutch Airlines, Qantas Airways, Delta Airlines, Lufthansa GBH and many more, were they have been used on most aircraft including Airbus A380 and Boeing 747. The Flying Carpet carries full CE accreditation and complies to aircraft ground support equipment regulations. One of the most difficult areas of an aircraft to reach is the tail, this problem can be solved by the use of a taildock, however if the hangar facility services many different aircraft types, then a multi type taildock is needed, these items of equipment tend to be very large by the shear nature of the various different heights and areas they need to access. A cost effective way to achieve access to a number of different aircraft tails is to use a self-propelled boomlift. Platform Sales & Hire have supplied Booms into many facilities including TNT Belgium, Qatar Airways Doha, Air Seychelles and many UK maintenance facilities. An 80ft Self-propelled boom can give access to the tails of the Airbus A380, Boeing 747 (66ft) and many others. With a multi type taildock costing in the region of £450K ($730k) a boom can be very attractive at under a quarter of that cost. We supply smaller booms for smaller aircraft such as the Boeing 737 and Airbus A320, they also give safe access to the crown skin of the fuselage. Platform Sales & Hire have over 20 years experience of supplying access platforms into the aviation industry. One of the most flexible items of equipment we have supplied is the self-propelled scissorlift access platform. We have supplied both new and refurbished, battery powered units for use inside the hangar. The standard model has a reach or working height of 10m (26ft), this model will give access to both the APU and horizontal stabiliser areas as well as most area’s of the fuselage. The advantages of using a scissorlift are that it can be adjusted to work at various heights, thus taking the place of a number of fixed height docking modules. 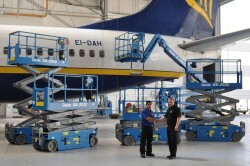 The compact size of the scissorlift also means that it is easy to manoeuvre around the aircraft in a busy hangar. For outside work a diesel powered unit is proffered, if both inside and outside use is needed then a dual fuel machine (battery/diesel) can be supplied. We have advised and supplied into many new hangars, as well as existing facilities for aircraft companies, such as Ryanair at both their Stansted and Prestwick facilities. 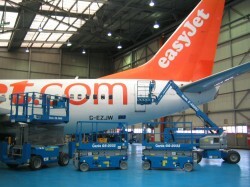 We have also supplied Easyjet at Luton airport with their self-propelled access equipment. We offer the following, outright purchase, contract rental and ad’hoc rental for short term periods of time. Marshalls of Cambridge were supplied with scissorlifts for a 3 year contract. We also offer complete service and maintenance support using our own service engineers.